No. No! NOO!!!!!!!!!!!!!!!!!!!!!!!!!! Don't attack me Jellyfish! AAAAAAAAAAAH. LOL. HEHEHEHEHEHE. Wow. They're, um, big and, um, ugly. I sure hope they taste good. Oh my goodness! Those are HUGE! Wow. 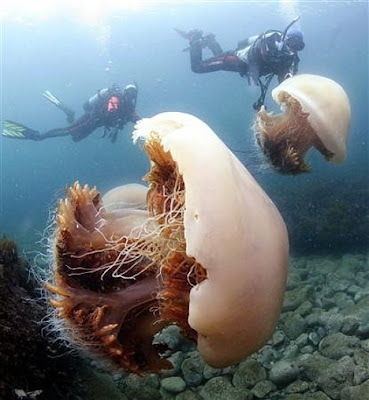 I've always liked how pretty jellyfish are, but those big ones are downright ugly. And rather creepy as well. 2nd biggest fear other than leperchans and giant squid? Jellyfish. They've always creeped me out. so I just couldn't read the post. -sobs into hands- By the way, how is your bug doing? Anyone ever been stung by jellyfish and get all itchy? It was weird, it didn't sting. It itched. So not cool! 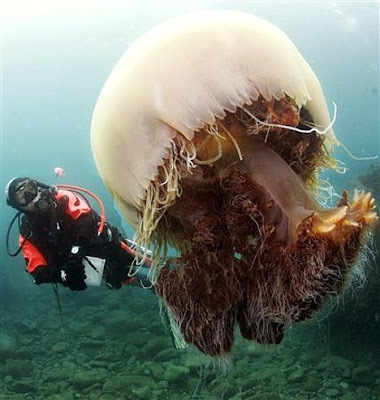 If I saw that jellyfish I think I'd blackout. Or run screaming off into the night. Or maybe poke it with a stick. A really long stick so I'd be very far away if the worst should happen. Lena La'Faye: You're scared of leprechauns? Interesting. Erin: Yes, feeling much better, thank you! The gigantic Echizen Kurage must pack a big sting...ZAAP!!! We have fresh water jellyfish in a lake by my house, luckaly for me they are two small to harm me! Wow! This is so odd. My mom was telling me about this from a wall street journal article. The dead fish apparently, because of the shock, have there eyes wide open and with a look of terror.